Every Tuesday, I will be choosing the best thing I chewed on during that day, and I will be sharing "the chosen one" for you guys to try. This is the reason why it's called "CHEWSDAY Tuesday" (hehehe). 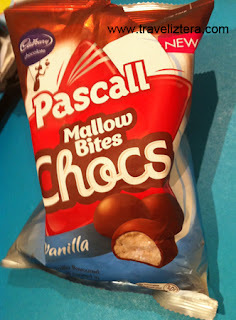 For today, I have chosen "Cadbury Pascall Mallow Bites Chocs"! While I was walking along the CANDY aisle at Woolworths (the Aussie "SM SAVEMORE"), something new caught my eye. As it says on its packaging, it is indeed "NEW". There were two flavours available: Honey Comb and Vanilla. I am not a fan of HONEY COMB because I find it too sweet, so I decided to go for VANILLA. I am currently chewing on a piece, and I must say that it is too sweet for me (I wonder how much sweeter Honey Comb is!) However, its sweetness did not stop me from getting some more. Yes, addicting! Come on... CADBURY CHOCOLATE is coating a small vanilla marshmallow. Hello??? But can I just say that I truly heart FIBISCO 's CHOCO MALLOWS? Yum! Going back to the Mallow Bites Chocs, yes, I know that I speak of weightloss and healthy eating all the time, but you do not need to deprive yourself! 5 mallow bites chocs will only give you around 107 calories. Actually, if you need a quick chocolate fix, you can get satisfied with just two or three pieces. Do I recommend it? Yes. Quick chocolate fix for you! i love that mallow bites.. really like !! 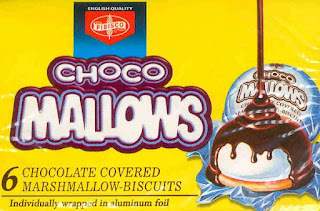 Choco mallows is still the best! I just discovered Mallow Bites today (I had the mint) and it was sooo yummy! Kailangan makabili uli. But yet, Choco Mallows forever!